Handmade to order in our UK studio. Please allow up to 7 days for delivery. 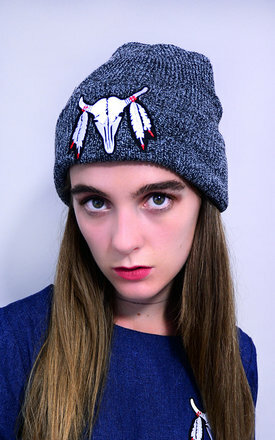 This cute Buffalo Patch Beanie from our AW16 range has a retro style patch sewn onto the fold. The wool is a thick knit in a vintage style grey and it has an 8cm turn up front. Perfect to add a bit of fun to your outfit while the Winter days set in.